The Social Pathologist: Picture du jour. Who is is fighting ISIL? I mean who is left to fight them with all these leaving the area? Western soldiers should be sent to fight for the land that these people abandoned and then give it back to them after it has been paid for in blood? Not that any of these would leave the West after successfully invading. I had the opportunity to meet one of these young Syrian refugees ( a boy late teens) a while back. At the time I could sense there was something just a bit off about his demeanor but I decided to cut him some slack due to the fact that he may be under some sort of PTSD. Well, it did take much time before my suspicions bared poisonous fruit. I don't remember how the topic cam up but we had debate about the origins of 911 and who was behind it. He believed Osama Bin Laden, the hero, was framed by the Jews (the Jews were behind 911). Well, suffice is to say, he was rabid Jew hater and I don't mean in a you-go-your-way but a psychologically unhinged type of hate. I admit, it was a frightening experience but whats more frightening is our own government is flooding the country with these Ticking-Time-Bombs. Individual resistance against ISIL, although noble, is unlikely to be effective without proper organization, the creation of which is likely beyond the ability of these military-age men. Lacking such organization, the primary responsibility of these men is attending to the safety of their immediate families -- which seems to be what they are doing. As Edward Abby said about "refugees" coming into the U.S. during the 1980's, "Give each one an AK47 and 100 rounds of ammunition, and turn them around. The people know who their enemies are..."
I'm aware of the complexities of the situation and the futility of lone charges however, there are legitimate opposition groups to both the Syrian regime and ISIL. It's not like they're the only two shows in town. The U.S. is activly funding a failing program to train fighters against ISIL. These guys are running away. The Ukrainians don't have this problem. Yes I agree, we're setting ourselves up for a world of problems. 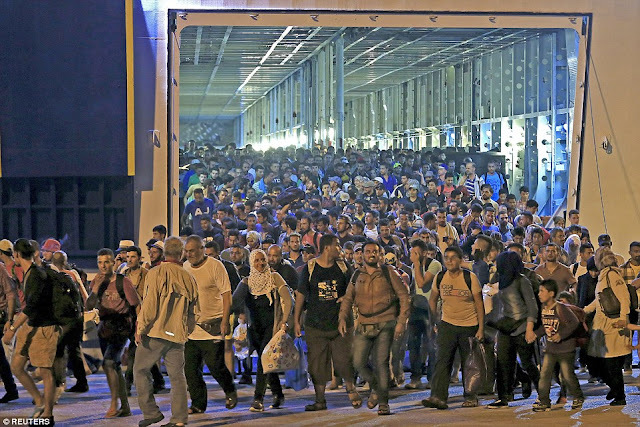 I can understand women and children being sent away from the fighting but watching these men run away is appalling. Futhermore, a lot of ISIL success has come about from the Iraqis and the Syrians running away. Not the type of thing you see with the Kurds. I have a friend in Germany who has completely bought into that Germany have the responsibility and the resources to take in the refugees regardless of the volume. My friend is a woman, of course, which means she is happy to be generous with other people's resources. She, like a lot of other Germans, seems to suffer from some WW2 PTSD: they can never wash the guilt from their hands. I think that is the source of many German's instinct to self annihilation of their own country. So it seems that the NWO and the Banksters have succeeded in immobilizing the self-preservation instincts of many Germans. Here I was, an American Jewish guy giving a pep talk to this German woman that, no - she should not be ashamed to be German and how much Germany have contributed to the world. I had the same conversation with a German nurse a few weeks ago. The war guilt runs deep. I don't think it is the NWO or banksters who are responsible for this, rather, the notion lays in the cognitive miserliness. While people may preach a doctrine of individuality, they primarily see themselves are subsisting within an ancestral group. Hence, whilst the average German knows they're not responsible for the crimes of the past, their "bloodline" somehow is. Bit like the shame a man would feel knowing that several of his family members were killers or criminals. It's also why many humans are fascinated with ancestry, a noble past relative conferring an implied nobility onto the descendant. It's also why loss class whites wanting to improve their status amongst others love white superiority philosophies, they feel that, because of bloodline, they can claim some part of the glory of European achievement. As for Europe, it's greatest problem at the moment seems that Germany cannot assert itself even for a good cause. And this has far deeper ramifications. Central Europe and Eastern Europe sees Germany as the influential power in the region. I know that when I was Croatia prior to the EU referendum, many Croats did not want to join it except they felt that the country could not reform itself alone. They were hoping that a country like Germany would impose strict rules within the country once membership was gained, hence reforming the system. Instead we get French rules with corrupting German money. The worst of both worlds. It seems that the Kurds in Syria composed of the YPG and PKK also include women in their fighting units due to their beliefs in gender equality not because of their desperation. What effect do you think this will have in the long term for the Kurds? Who seem with substantial US airstrikes manage to drive ISIL back. What effect do you think this will have in the long term for the Kurds? Probably none militarily . Kurdish women will probably be less feminine and therefore less attractive thereby causing social dysfunction in the long term. But understand that the Kurds have drifted leftward due to historical contingency and that has bought a host of other problems as well. My daughter has spent a lot of time among the Kurds - with the approval of the US Army. According to her, never forget that the Kurds are, for the most part, very smart; they understand the western mind very well and know how to play it. The videos one sees on youtube of Kurdish women warriors always depict really feminine, really photogenic young women. An accident this is not. This gambit goes back a thousand years. They are broadcasting this: "Our feminine, well made up teenage girls are harder fighters than your best young men.... "Losers!!!" And no, they do not let their young women get turned into cannon-fodder.It is taunt,a form of theater, not a tactical reality. In other words, what you hear from the Kurds in "Social Media" has been carefully crafted to create a precisely intended effect.. Personally, I hope they win the fight utterly and get a large chunk of territory. They treated my tall, blonde haired girl-child extremely well and they are among the most honest dealers anywhere; nevermind the middle east. I have a lot of sympathy for them. They're the only real "good guys" in this fight. They've have a lonely struggle against far superior powers for a long time. I hope history finally turns for them.